One of the best parts of my job is getting to work with children. Sometimes they can be a handful, and a little difficult to work with, but most of the time they are so much fun. One of my favorites is a little girl that was adopted from China. We'll call her Ellie. She is one of the most articulate little three year olds I've ever seen, and so adorable. She chatters away whenever I work on her mom's teeth, and sometimes she'll come over to just stand by the chair and hold her mom's hand. She says some of the funniest things too. She's very smart, and just so curious about everything around her. Every time I pick up a new instrument she asks, "What is that?" I responded to her question one time and said that it was an instrument called an explorer. "Like Dora!" she exclaimed. At the end of her mother's last visit, after my boss had done the dental exam, Ellie was sitting on her mother's lap, and looked seriously at Dr. Gilbert (name has been changed for privacy's sake). "Are you a mommy?" she asked. "No, not yet," my boss replied. Ellie's eyes turned to look at me. "Callie's not a mommy yet either," Dr. Gilbert explained. Ellie squinted her eyes and turned to look at her mom. "Why, Mommy? Why aren't they mommy's yet?" she asked innocently. Dr. Gilbert turned to me with laughter in her eyes, "I guess we need to get moving and get some mommy's in this office!" That made me laugh. As soon as I can become a mommy, I'll get right on that, Ellie! Oh Sponges, How Expensive You Are! Alright, I have a money-saving tip! I won't pretend to be a money-saving guru, like all these coupon-clipping bloggers who have whole blogs dedicated to the saving of money. I read their blogs, but I'm afraid I'll never be as good as that. However, there is one fact that is universally recognized: sponges are expensive. I'm not sure if it's the technology involved in making a sponge that makes it so expensive, or what. The reasons why are a little sketchy. But I hate forking over 4-6 dollars to get a three-pack of sponges, when I know that I'll have to through away each sponge after a month or two anyway. I've tried and tried to make them last longer, but there comes a point when that ragged little clump of wetness just becomes an eyesore. Not to mention that fact that they start to stink eventually, no matter how clean you try to keep them. Say hello to the local Dollar Tree! Did you know that they sell sponges at the dollar store? And that when you go to the register, that three-pack of sponges does indeed ring up to be $1? Sure, they aren't the cute, name-brand sponges. But who cares? I'm going to throw them away after a month anyway. I'm sure you coupon-clippers out there are going to tell me that if I just look on this or that website, or get a Sunday newspaper, then I could have the name-brand three-pack for a dollar. But that is so much effort. Plus, who's to guarantee that I'll still be able to find those coupons in two months, when I need more sponges? I'm afraid I'm just not to your level of money-saving yet. I'll probably get there eventually. But for now, I'm a fan of the dollar store for certain items. Not all items, because some of them you could actually get cheaper at a normal grocery retailer. But certain items are definitely worth the ten minutes it takes to drive over to the dollar store. And the Master so gently said, "Child, you must wait." "Wait, you say, wait?" my indignant reply. "Lord, I need answers, I need to know why! Or even a "no" to which I can resign. I'm weary of asking! I need a reply!" As my Master replied once again, "You must wait." And grumbled to God, "So I'm waiting . . . for what?" And He tenderly said, "I could give you a sign. All you seek, I could give, and pleased you would be. You would have what you want, But you wouldn't know Me. But you'd not know the depth of the beat of My Heart. But, Oh the Loss! If I lost what I'm doing in you! That the greatest of gifts is to get to know Me. my most precious answer of all is still, 'Wait.'" Today we're stopping in Haiti! 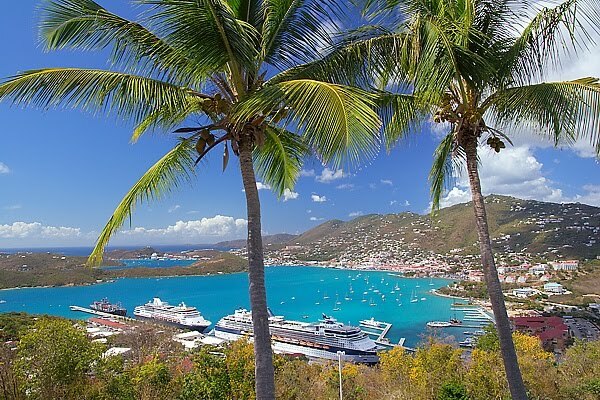 About a week before our cruise, I looked up our itinierary, because Derek and I were trying to plan out some of the things we wanted to do at each port, and I saw that our last destination would be Haiti. What? Haiti? I thought we were supposed to be stopping at the cruise line's private island! Well, my wonderful husband called to see what was up, and it turns out that the cruise line owns a portion of Haiti. That was a relief, because I was wondering if it would be safe to explore at all in Haiti, considering the earthquake they went through last year and everything. It's kind of cool, because our cruise line is actually involved in the relief effort for Haiti too. So here we are in Labadee, Haiti, the cruise line's private island. This isn't the exact ship we're on, but it's similar. I'm kind of curious to see what this place is like. Will it be different than any of the other ports because the cruise line owns it? I'll let you all know how it is when we get back! Image from About.com, by Justin Miller. 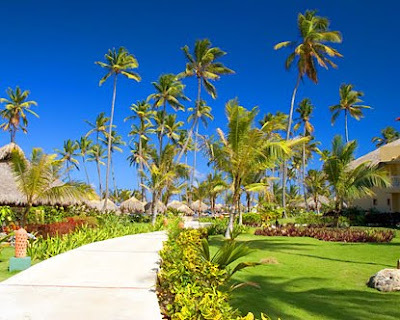 We're porting in Samana. 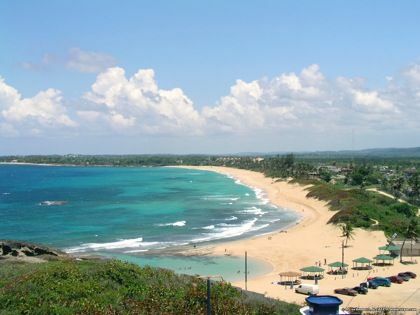 I don't know too much about the Dominican Republic, but I hear they have some nice beaches. I assure you, I'm recording all my impressions and thoughts and travel tips, so when I get back and post them, then you'll hear all about it! Once again, not sure what excursions we're doing yet, but St. Thomas looks so pretty - I'm pretty excited to stop here! P.S. I got the image from HarmonySuite.com. We will not being staying a a Harmony Suite, we'll be staying on the boat, but they had some nice pictures. A little over a year ago, I wrote a list of "Things To Do Before I Die". You can see the original list in my "One Hundred" post. I thought it was about time to revisit that list and see where it stands! I've been blessed in this last year to be able to accomplish quite a few of those things. So here is the updated bucket list. 3. Go to Hershey, Pennsylvania. 4. Go to Italy with Derek. 6. Get my Bacholor's degree in Microbiology. 7. Name a new species of bacteria after myself. 8. Rebuild a classic car. 10. Do another painting (for those of you who don't know, I used to paint when I was younger). Working on this. 12. Adopt a child (if it's the Lord's will). 13. Own an orange tree and make it grow without killing it. 14. See a play on Broadway. 15. Shop in New York. 16. Grow old and wrinkly with Derek. 17. Really be a June Cleaver mom/housewife. 18. See my children accept Jesus as their Savior. 19. Work on a conservative's political campaign. 20. Spend a significant amount of time becoming an expert at skiing one winter. 21. Learn to play tennis. 22. See an Elvis impersonator. 24. Get a French manicure. Derek got me a professional manicure for my 2009 birthday: My Lovely Birthday Surprise. 26. Spend one night on said cruise dancing with my husband. Hopefully also in progress. 27. Own our own house (really own it - as in owing no money on it). 28. Visit Prince Edward Island and see the house that inspired Anne of Green Gables. 29. Stay at a super-fancy hotel near Niagra Falls for at least one night. 30. Stay in shape, even when I'm old. 31. Lay outside on a warm summer night and count stars with Derek. 32. Help someone in a crisis. 33. Really find my spiritual gift and a way to use it for the Lord. 34. Read all of C.S. Lewis's books. 35. Take a class on fencing. 36. Celebrate out 50th wedding anniversary in Hawaii. 37. Own a pair of red high heels. Also part of my 2009 birthday! Derek told me to go buy an outfit for our birthday outing, which included some red high heels: My Lovely Birthday Surprise. 38. Volunteer at a Crisis Pregnancy Center. 39. Let my hair go gray. 40. Spend quality one-on-one time with each of my kids at least every few months. 41. Own a beach house. 42. Teach a Sunday school class again. 43. Go tubing down a river. 44. Get a pair of roller-skates. I did this, even though they don't fit me perfectly! See Pass the Hand Sanitizer. 45. Go spelunking (with a guide of course). 46. Research my family tree. competition. Even though it wasn't a true-blue, "real" competition - it was a little more like a show, but they were competing, so I think it counts. See Campfires, Fairs, and Mini Golf. 49. Take a cake-decorating class. 50. Own 10-plus acres of land. 51. Learn to do "latte-art". 52. Take our kids to Disney World on vacation. 53. Host an afternoon tea. 54. Play Barbies with my girls. 55. Tour a castle in Ireland. 56. Climb a tree with my boys. 57. Never get a cavity ( I currently have no fillings in my mouth, and I would like to keep it that way). In Progress. 58. Visit the Smithsonian. For our 2009 vacation: Museums, Museums, and More Museums: Vacation Recap Part Two. 60. See the Statue of Liberty in person. 61. Have a library in our house with a rolling ladder. tea. 2009 Vacation: Scary Bugs, Wet Air, and Subtle Colors: My Description Of The East Coast. 63. Find a conche shell on the beach. 65. Get Lasic eye surgery. 67. Have a milkshake and hamburger ready when one of my sons has a crisis. 68. Window shop and talk with my daughters when one of them has a crisis. 71. Have a home theater. 72. Make the perect chocolate cake. 74. Buy a Beach Boys CD. Well, I was given one for my 2009 birthday, but that still counts. 75. Have an all-day Star Wars marathon. 77. Spend a day at the zoo with some little kids (hopefully mine). 79. See a Redwood tree. 80. Ride in a hot air balloon. 81. Stay in an all-inclusive beach resort in the Carribean. 82. Go snorkeling. Hopefully In Progress. 83. Go on a helicopter ride with Derek. 84. Go on a sleigh-ride at Christmas time. 86. Learn to make a vase or something on a potter's wheel. 87. Build a snow fort with Derek. 88. Throw a New Year's Eve party. 89. Ride in a limosine. would be good to have my permit - I'm a big right-to bear-arms advocate). 91. Make home-made ice cream. 92. Go to a symphony orcestra concert. Derek and I went to a Christmas concert, and it was lovely: Candy Canes, Parades, and Scheherazade. 93. Go on a vacation to Australia. 94. Get a little black dress. 95. Take swing-dancing lessons with Derek. 96. Swim in a lake. 98. Ride in a snowmobile. 99. Try a chocolate "soda" (although here we call it pop). 100. Go to a professional football game. And there it is! I'm feeling pretty good about everything I've been able to do this last year. I'm probably going to put up a link to this list on the main page when I get back, so I can keep it updated as I cross each thing off. If you've never written a bucket list, I recommend you try it! Well, right now we're in the middle of our cruise, and unless I got on the ship a few days ago and found out they have free Wi-Fi or something, I just can't afford the international roaming charges associated with using our Verizon Wireless internet chip. Since I may not be able to post, I just wanted to keep you updated on where we are, even if I can't tell you how beautiful it is from personal experience yet. We're porting in San Juan. We'll probably do some sort of shore excursion, or go lie on the beach for a while. Not sure yet, but as soon as I get back I'll post some pictures that I actually took, instead of one that I stole from Getaway Bahamas. 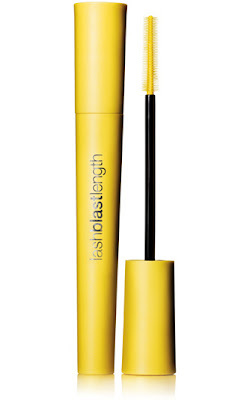 I just found a fabulous new mascara. I was running low on mascara a little while ago, and I figured I'd better get some more. It just didn't do a thing for my lashes. It may have made them look longer, a little bit, but it didn't help them curl at all, and they looked a little thin. All mascaras are not equally effective. Anyway, I told Derek of my complaints, and he said to go get a different one. So I did. 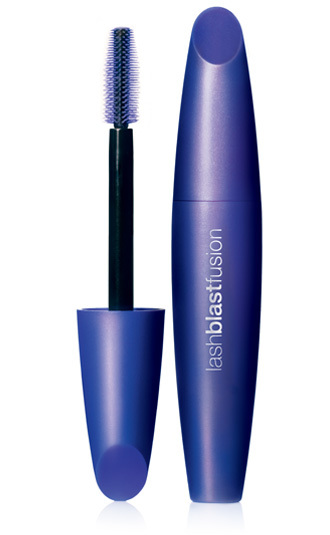 Covergirl Lash Blast Fusion: Length + Volume. And it is fabulous! 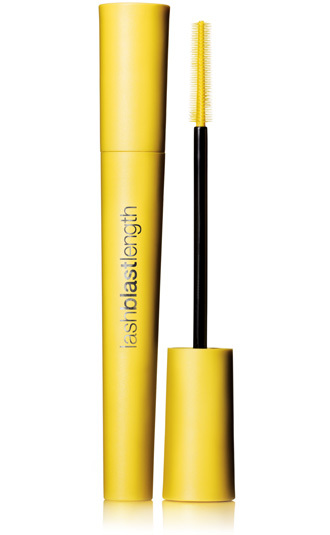 Goes on nice and smooth, stretches out your lashes out and makes it look like they're nice and thick. I would highly recommend it. At 1:00 AM, Thursday, while all of you are sleeping peacefully in your beds, I'll be boarding our plane. Yep, we had to book another red-eye flight. But it's much less expensive that way, so I guess I can't really complain. My mom is taking us to the airport this evening, so we'll be waiting in the airport for four hours or so before we board our plane. Then we have another layover (in Dallas, I think), before we finally arrive on the East coast at 9:47 AM. I doubt I'll get any sleep. And because of that, I'm going to be taking a nap this afternoon! Just as soon as I finish cleaning the house. On the bright side, by 1:00 PM tomorrow we'll be boarding our cruise ship! Then I can sleep all I want as we sail away across the Atlantic. I don't know if the ship will have Wi-Fi available, and it would cost way too much to use our internet service out of range like that, so I probably won't be able to update you all on our trip or moderate comments until we get back. However, I do have posts scheduled while I'm gone. Got to keep the blog updated, you know! I'll respond to any e-mails and catch up on blog reading when I get back home. Oh, Vacation, you are almost here! P.S. Kelley is having a great giveaway for a forty dollar gift card to CSN stores!. I hope I win, even though I won't know until June, or at least the very end of May, whether I did or not. You all should check it out too! Hmm, did I forget anything? What do you think? I think it's better to be prepared and bring something that you may not need, instead of getting there and wishing you had brought something that you did end up needing and didn't bring. You may be thinking, "How does she fit all that in her suitcase?" I have a very large suitcase. You may also be thinking, "How is she going to keep that under the 50 pound weight limit?" I have a trick. I weigh myself alone first, then I pick up the completely packed suitcase and weigh again while holding it. That way I can tell how much it weighs. I usually try to be at least five pounds under the limit, just in case their scale is different than mine. Then if the suitcase is too heavy, I put a few books, or my blow dryer or something, in Derek's suitcase, because men just don't need to bring as much stuff as we girls do. Also, I just happened to come across a great travel tip recently. They said that if you are traveling with your husband, put about half of his clothes in your suitcase, and half of your clothes in his. That way if one of the bags gets lost, you still both have some clothes to wear. I thought that was a pretty smart idea! So that's the plan. Any suggestions? Nashville is under several feet of water. 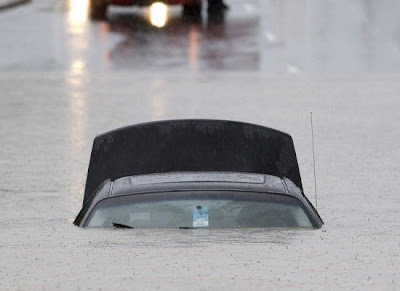 I was rather shocked when a friend told me last weekend that there was a huge flood in Nashville - because I hadn't heard a thing about it! Not on the radio, not on TV. It's rather bizarre how no one is covering this flood. It's not like a little localized flooding either. It's the entire city. I know there was the whole car-bombing incident, and the oil spill, which is what the media seems to be more concerned about at the moment. Those things are important too, but I really don't think it's a good excuse to practically ignore all those people in Nashville. Anyway, please say a prayer for those in Nashville who are trying to piece everything back together. They're handling the damage from the flooding by themselves - I say good for them for not running and whining to the government to save them! If you're interested in donating something to help, you can check out the Middle Tennessee Red Cross. Image from the Huffington Post. Video from YouTube. Click to see more photos of the Nashville Flood. The members of my family are all big country music fans. We know of artists that most you probably have never even heard of. My brother and sister are able to find some great new songs, and my mom and dad just know alot of good country songs that they don't play on the radio anymore. I contribute to the mix sometimes too, but mostly I get to benefit from all their knowledge. I spent Mother's Day with my family at my parent's house, and I was reminded once again of a few songs that I've forgotten about, and I heard a new one that I hadn't heard yet. These to songs need to be added to the "Songs That Make Me Cry (In A Good Way)" list. So if any of you fellow country music fans ever get tired of the music you have, and you need ideas for some new country artists to listen to, tell me, and I'll tell them, and we'll get you all set up! Recently I started reading a book called Start Your Family: Inspiration For Having Babies by Steve and Candice Watters. It's basically a book that addresses the blessings of parenthood and our culture's increasingly negative attitude toward becoming a parent. Chapter Five contained some startling statistics. I wouldn't consider myself ignorant of infertility at all - after all, I've been dealing with ovulatory infertility for the past ten months. But some of these stats were even surprising for me. -For women, fertility begins to decline at age 27, the decline quickens after age 35, and by the time a woman is 40 her ability to get pregnant plummets. See Resource 2. -At age 40, half of a women's eggs are chromosomally abnormal. By age 42, 90% of her eggs are chromosomally abnormal. See Resource 3. -For men, fertility begins to decline after the age of 35. See Resource 2. -Only about a third of couples who seek fertility treatment actually leave with a baby, and "that number can fluctuate dramatically depending on the reason a couple can't conceive naturally and the woman's age." See Resource 4. -In-vitro fertilization treatments (the most technologically advanced method of conceiving, if all else fails) cost around $12,400, and women may need several rounds of IVF to concieve, if they conceive at all. "IVF simply may never work for some older women." See Resource 4. Derek and I decided when we first got married that we'd like to wait two or three years to have children, just to give us time to get some debt paid off and get used to being married before adding a baby into the mix. 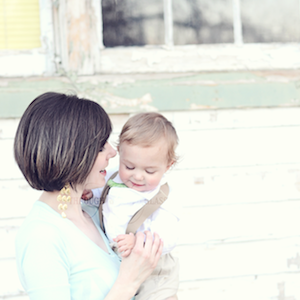 I think most couples today look at a variety of factors when considering when to have children. Those factors may include when they'll be in a good financial situation, when they'll be emotionally ready, where they want to be in their careers before they have children, and it sometimes includes a list of things that they would like to do or explore before having a baby. But how many of us really consider fertility in our decision of when to have children? No one really likes to talk about this for some reason, and those who do may be considered pessimistic. But the chances of conceiving decrease the older you get. You won't be infinitely fertile, and the hard fact is that you won't be able to have a baby whenever you want in life. Why is it that we micro-analyze every other factor of when to have children, but we somehow overlook the most important and practical aspect of that decision - the question of "Will I still be fertile at the time when we want to have our first baby?" I must admit that I am guilty of this myself. Before we were married, when Derek and I discussed our timeline of having children, the concept of how our fertility would decrease over time didn't even enter the equation. I can't believe I never thought of that before, as I think of it now. Twenty-seven. Fertility starts to decrease for us women at the age of twenty-seven. I don't know where the rest of you young married ladies are, but that only gives me a few more years before it becomes even harder to have a baby. As if I weren't having enough trouble now. Sure, there are alot of celebrities who have babies after age forty. But they are the exception, and we don't know how much time and money went into making that possible. Sure, there are many women who get pregnant without any help after 35, but the chances of that happening are far less than if they had started earlier (about 30% as opposed to 50%, Resource 2). And for many couples it just never happens, because they waited too long. As for me, a woman in my early twenties who is already having struggles with her fertility, I urge you young married ladies out there who are in the midst of deciding when to have children to seriously consider your own fertility as an aspect of that decision. You may be one of those women who can conceive easily at a later age. But then again, you may not be. It's something every couple should have in their minds when making the decision of timing, and the goal of this post is just to get you all thinking about it. I want each of you to experience every joy that life has to offer, and every blessing the Lord has to give you, but especially the gift of children. And I would hate to see anyone miss out on that blessing because no one brought the fertility factor to their attention when they were still young enough to do something about it. I'd like to end this post with a quote from Start Your Family. I found this quote to be very encouraging, especially for those of us already struggling with fertility problems. We should be wise concerning our fertility and the timing of babies - but God is still (and always will be) in control, in spite of the struggles we face, even when they result from our own mistakes. "As I wrote this chapter I thought my fertility window was closing - or more accurately, slamming shut - but then something happened. Psalm 103 praises the God, "who satisfies your years with good things, so that your youth is renewed like the eagle." "He Himself knows our frame," the psalmist instructs, "He is mindful that we are but dust . . . But the lovingkindness of the Lord is from everlasting to everlasting on those who fear Him." (5, 14, 17, NASB). We serve a wonder-working God. That's what my doctors - all three of them - concluded when, after three sets of blood tests that confirmed my childbearing years were over, I got pregnant. They all said the same thing: "It's a miracle." And so as my belly swells, even as I finish the edits on this chapter, I'm reminded that it's our job to be faithful to learn the facts about our bodies and make the most of our fertility. But I also know that God is sovereign over all. It's up to us to do what we can. Then we can trust Him for the rest. We are not without hope." -Candice Watters, Start Your Family, page 89. Emphasis mine. 1. Watters, Steve and Candice; Starting Your Family: Inspiration For Having Babies. Moody Publishers, 2009. Buy the book here: http://www.amazon.com/gp/product/0802458300?ie=UTF8&tag=helgetmar-20&linkCode=xm2&creativeASIN=0802458300. 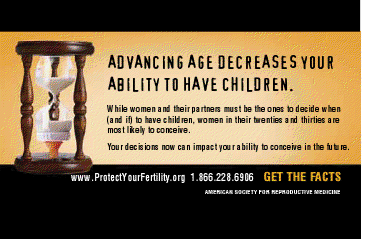 2. de Vries, Lloyd; "Fertility: Less Time Than You Think", CBSNews.com, April 30, 2002. http://www.cbsnews.com/stories/2002/04/30/health/main507580.shtml . 3. Gibbs, Nancy; "Making Time For A Baby". Time.com, April 15, 2002. http://www.time.com/time/magazine/article/0,9171,1002217-2,00.html. 4. Stenson, Jacqueline; "Have Kids? Sure . . .Someday". MSNBC.com, June 6, 2007. http://www.msnbc.msn.com/id/17937795/ns/health-pregnancy//. 5. Image from the American Society For Reproductive Medicine Ad Campaign. Image has been cropped for easier viewing on this page. See original ad here: http://www.protectyourfertility.org/pdfs/4up.pdf. Lately I've been thinking about plastic surgery. No, not about getting it myself! About other people getting plastic surgery. I think it started when I saw an article in our dental office about Heidi from a show called The Hills. The article followed her journey of getting ten different plastic surgery procedures done in one day. Apparently she got her chin reduced, her eyebrows arched, augmentation, liposuction, Botox, fat injections in various areas of her face, and her ears pinned back. I didn't really know who she was, and with all that work done I figured she must be in her late thirties at least. But she's only 23 years old, and I guess she had her first plastic surgeries at the age of 21. Here are some before and after pictures - the first two are from US News, the third one is from NY Daily News. Does anyone see anything wrong with the way she looked before? I don't. She was a natural beauty, and now she's an unnatural beauty. I guess I'm just a little confused. I can understand plastic surgery in some cases, but I just don't see anything wrong with the before pictures. 1. This is just what celebrities do, and I think it reflects a deeper problem in our society. I read the article (I know - but it's like a car accident or something, you just can't look away), and it stated that all celebrities are doing these plastic surgeries, Heidi Montag is just the only one that's willing to talk about it. I know part of the reason that celebrities get these surgeries is because they have the resources to do them, but I think it really comes down to pressure from society. Celebrities are expected to be perfect physically, even though there are very few standards placed on their behavior. This pressure for physical perfection might come from peer pressure, because if one celebrity is doing it, everyone else has to keep up. But I think alot of the pressure comes from the rest of us as well. I remember listening to the radio a couple years ago, and some DJ was complaining about Brittany Spears being out of shape. Why do we care so much if Brittany Spears is in perfect shape or not? I don't care, do you? But she was getting a pretty hard time for being too heavy at that time. Why does a person have to have a perfect body, or perfect looks, just because they're famous? I think alot of people just want to point out flaws in other people to feel better about themselves, and famous people bear the brunt of it because they're so much in the public eye. I'm guilty of this at times as well - I make a mental note if some actress gained a bunch of weight, and it does make me feel better about my own weight. Is that right? Absolutely not. But physical beauty is an idol in our culture, and it can sneak into even the most well-meaning hearts. I think it is important to try to stay in good shape, but being in good shape can look alot different from person to person depending on a variety of factors. It's okay to try to maintain a healthy appearance, but our society doesn't just want healthy bodies - it wants Barbie and Ken doll bodies. And that's the problem. In the end, it's disturbing to me that as a society we're so self-concsious about our looks - enough that people spend ten billion dollars a year on cosmetic surgery (See DustyInfo.com for more facts on plastic surgery). 2. It disturbs me to think of someone who is naturally beautiful like that hating her looks so much that she gets that many plastic surgeries at the age of 23. I know people like to fight the aging process, and alot of the money that's spent on plastic surgeries is to combat wrinkles and that downward pull on our features that comes with aging. But if you're getting so many plastic surgeries at 23 years old, you must be genuinely unhappy with your whole appearance. Every person who ever lived was made in the image of God. He knew what they would look like before He knit them together in the womb (Psalm 139:13). He gave them their eyes, their noses, their figures, and he wove them together in the depths of the earth (Psalm 139:15). But we don't appreciate the way He has made us - we pick out every little flaw that we can find, flaws that are not measured by His standards, but by our culture's standards. I have done this myself, as I suspect many of you have as well. Heidi Montag's story has just reminded me how far this dislike of our physical appearances can go, and I think it must grieve Him that we so often despise His handiwork. 3. Finally, it disturbs me because people like Heidi Montag are trying to attain personal fulfillment from physical beauty. It saddens me, because they will never reach personal fulfillment or happiness that way, and they don't even know it. People spend their whole lives looking for fulfillment from many different places, not realizing that they'll only find true fulfillment through a relationship with Jesus Christ. The Lord is the only one who can fill that empty place that each of us have from the moment we're born - He's the only one who can give us purpose and joy in life. And so many people look in the wrong places for that. People don't realize that instead of spending so much time and money and effort chasing happiness through things that don't last, they could be enjoying true fulfillment by living out their purpose in life - to know and glorify God. And for someone to spend their life looking everywhere else except to Jesus for that kind of fulfillment, only to realize their mistake when they leave this world, is the greatest personal tragedy that any person will ever know. Do you have that fulfillment and purpose and joy that only comes in Christ? I hope that you'll share that message with someone this week, even if it's just in a blog post (like me). So many are lost out there. They're waiting for someone to show them where they need to go. Let's be the ones to point them to the only Way, Truth, and Life (John 14:6), shall we? I'll pray for you in your efforts if you pray for me in mine. My little niece is turning two years old this May. She is absolutely adorable. I'm not going to post a picture, because I didn't ask her mom, so you'll just have to take my word for it. She's such a little girly-girl, even at two years old. She loves all my earrings and necklaces that I wear when I see her - she just walks up with her eyes glued to the necklace and reaches out to finger it. She loves sparkly things. Sometimes I think she just likes me to hold her so she can play with my necklaces, but hey, I'll take that! She's the sweetest little thing. Anyway, they're having a little birthday party for her on Thursday, and I wasn't quite sure what to get her for a present. Two years old is such a hard age - most of the cool toys at the store say "3+" on them, and I wanted to get her something pretty. A cute little Minnie Mouse Purse (I figured she'd want to copy her mama), and some little two-year-old-friendly sparkly bracelets. If she doesn't like them now, she'll like them six months from now, so I figured this would be a cute little present. Have you ever bought a present for a two year old? This is my first time. What do you think? Did I do good? Categories: Family, Fun Stuff, What Do You Think? Plus a cookbook that I'm throwing in there, just because. And yes, I do have a necklace just like that. I couldn't resist getting one for myself. So whoever wins will be across the country somewhere, wearing the same necklace as me! Sorry about the following images - they're rather fuzzy, but it's the best I can do. Kara from KSS Blog, come on down! You are the new owner of these lovely items. I hope you enjoy them! I think I still have your address somewhere - I'll e-mail you if I don't. Let me know if you want me to mail these to a different address or anything. And don't worry, everyone, more giveaways will be coming in the future, and somebody's got to win, so keep reading . . . Yes, I actually hung that sign! I figured out that the thing that is really causing my messy closet problems is the home-decorating items that I've gradually accumulated over the last year and a half. I know I listed a few different kinds of items in my last post, but that was mostly for variety's sake - if a book or a clothing item ends up in the closet, it typically doesn't stay there long. The decorating items are the actual problem area, and that is what's causing the build-up. I think it's because I feel like I have to have everything perfect before I hang something on the wall, or put it on a table, or whatever - I have to know exactly where it will go and what I'll put with it, because I don't like to hang things up or put things somewhere and then change it. And it takes me a while to decide where I want things. Thus, they sit in the closet until I decide. But I bought each of those things for a reason, with a purpose in mind. When I bought them I knew which room I wanted them to go in, and I had a vague idea of the arrangement. But because I wasn't sure if it was perfect, I didn't put them up right away. Perfectionism can make one's life so difficult in so many ways. Perfectionism is like a less severe form of Obsessive-compulsive Disorder. There are so many things you may not do that you could do, because they have to be perfect first. Sometimes perfectionism is a good thing. It leads you to strive for excellence. But it can also just become a ball and chain if you let it. I think that's the underlying cause of my weird closet (no pun intended) habit. I get something for a certain room in my house, and then I get all bogged down in finding the perfect place to put them, or the perfect way to arrange them, and I never use them at all. And that is poor stewardship, and it's a waste. Sometimes things just don't have to be perfect. So hanging this lovely sign was a first step. Yes, I think it would have looked cute with family pictures, but then I have to find the perfect family pictures, and the perfect place to hang them, and the perfect arrangement. And you know when it would actually get hung? Maybe in another year. No more of that. So, I found a place I thought it would look nice, and I hung it. And I'm quite happy with the effect. And if I have to move it at a later date, I'll move it, and it won't be a big deal. I want to be a better steward of the things the Lord has given us, and that means not wasting a perfectly good sign by being too OCD to use it, or buying something before I can use it (ie: Wait until the basement is finished, Callie!). So that's my plan. I'll keep you updated with anything else I get out of that closet. And don't forget to enter the giveaway! I announce the winner tomorrow, so this is your last chance!